Jacinta Maroquin Pablo lost five of her children before they turned 2. Rosa Pablo Perez lost her middle child before she turned 3. Neither woman knows why, but they both know they waited too long to see a doctor. Not realizing how sick their children were, neither mother wanted to spend money they didn't have to hire a driver to take them to the nearest clinic. Jacinta and Rosa live in Comitancillo, one of Guatemala's poorest areas, where Catholic Relief Services' program SEGAMIL—which stands for Food Security Focused on the First Thousand Days—is trying to ensure that what happened to their children doesn't happen to others. We're working with 10,500 farmer households per year to enhance their access to food. In addition to distributing this much-needed food to vulnerable children, pregnant women and new mothers, SEGAMIL works with families to improve hygiene and nutrition, and increase the use of medical services. 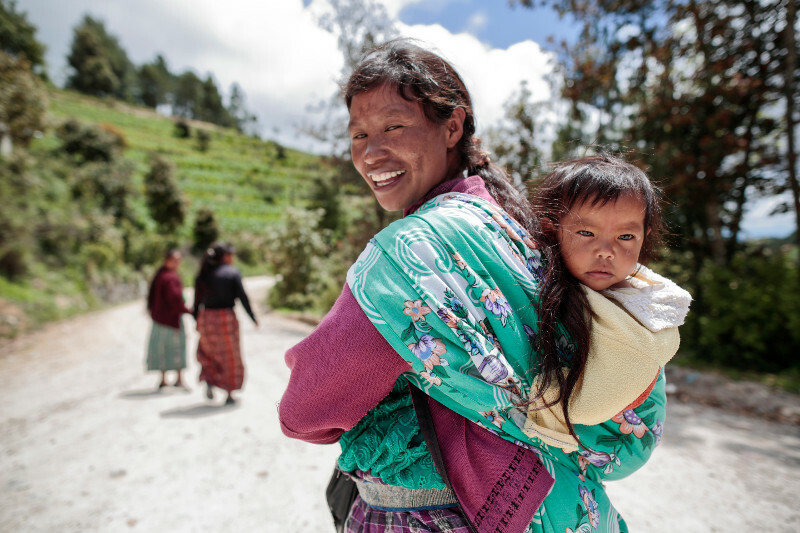 Women like Jacinta and Rosa are learning about preventing malnutrition and treating common conditions like diarrhea and pneumonia that can be fatal, especially for Guatemala's poor and malnourished children. 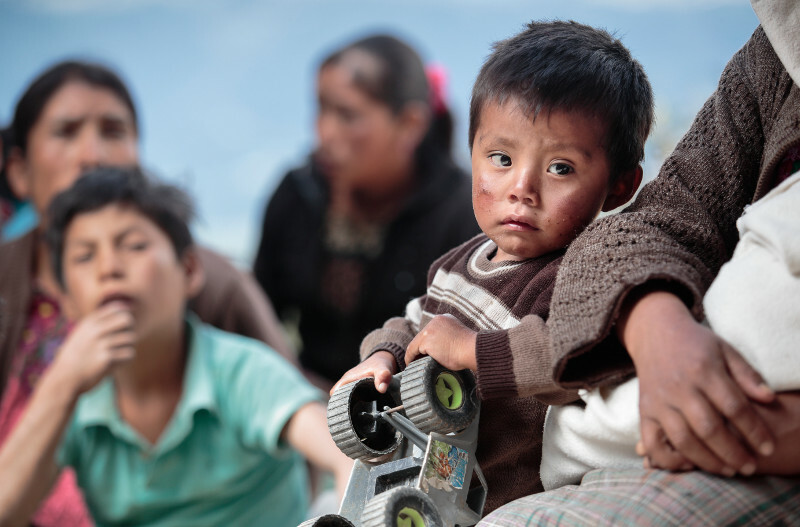 "Malnutrition is often a part of a vicious cycle that includes poverty and disease," says Monica Rodriguez, who oversees the 6-year project in Guatemala. "A malnourished child gets sick more often, doesn't do as well in school and can become physically and mentally stunted. This keeps communities trapped in the cycle of poverty." In San Marcos, the Western Highlands state where Comitancillo is located, food security is of grave concern. The malnutrition rate is higher than in some parts of sub-Saharan Africa, and more than two-thirds of the population is poor. For families like Jacinta's and Rosa's, growing enough food to feed a family is a yearly struggle. And decades of government policies have excluded the mostly Mayan indigenous people of the region from accessing basic services. "That is why CRS takes a household approach to keeping families healthy by helping them improve their agriculture, health care, education and nutrition, while diversifying their income," Rodriguez says. For Rosa, changing the pattern that led to her daughter's death is a family affair. She is a community health promoter—a member of a small but effective group of volunteers who are learning, among other skills, how to identify danger signs in pregnancy and childbirth, and how to tend to household livestock in a sanitary way. They share these skills with other families. For example, Rosa is often asked to lead community workshops on the health- and nutrition-related topics in the SEGAMIL curriculum. On a recent morning, some 40 women and their children gathered on the patio of a neighborhood convenience store. Sitting mostly on logs and buckets—many with babies wrapped in blankets and tied by colorful strips of cloth to their mothers' backs—the women were there to learn how to take care of their little ones when they're sick. The lesson was timely, given that most of the children there were sniffling and coughing. The CRS trainer showed the group how to make a household serum out of water, sugar and a little salt to keep children with diarrhea from becoming dehydrated. Diarrhea is a common condition in Comitancillo, where potable water is scarce. She talked about how to reduce an infant's fever without aspirin by placing a wet cloth on the baby's head and belly, and how to know when it's time to take the baby to a doctor. "We keep the fever down that way, not by giving him aspirin and not by giving him herbs," the trainer says to the women. "And in the morning, it is important to take him to the clinic quickly. We can't wait too long to take our sick baby to a doctor." It is a lesson Rosa wishes she had learned before her daughter got sick with diarrhea and later was diagnosed at the health clinic with pneumonia. The same thing happened to Jacinta's 2-year-old daughter, the oldest of the 5 among her 14 children who died. "We thought she would be okay with an aspirin, and we didn't have the money to go to the clinic," Rosa says, with tears in her eyes. "On the third day we finally took her and that's where I left her." Rosa and her husband, Patrocinio, now have a 6-month-old boy, who she says is healthier than her two remaining children were as babies. "We never had a program here to help us, to tell us about how to handle these things. Now I know about hand-washing and the warning signs for when we need to go to the clinic," she said. She and the other women from her community who participate in the project now have water filters to ensure a constant source of safe water. And they receive a monthly food package that includes rice, oil and soy-corn meal, which they use to make a host of nutritious foods. 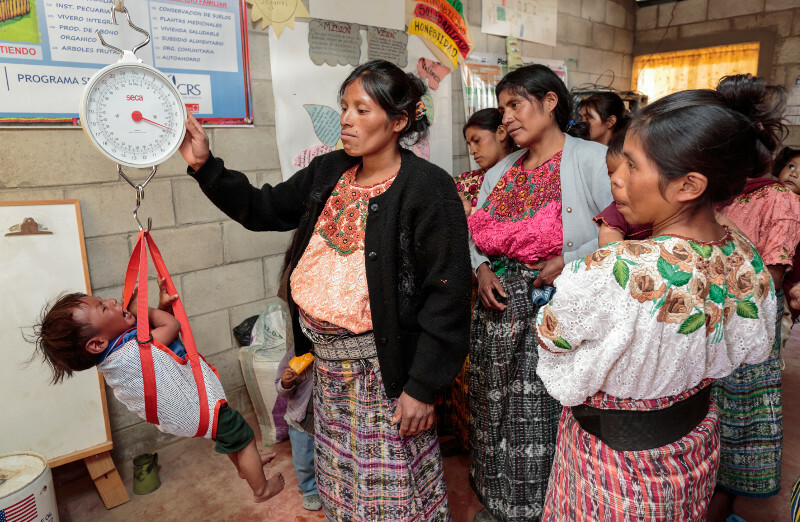 The food helps enhance families' diets and is an incentive to stay with the program, which requires women and their babies to attend monthly meetings where their babies' weight and health are monitored. Community health workers also visit homes to monitor the health of children who have been identified as sick or underweight. To improve her family's diet, Rosa recently started a household garden where she cultivates vegetables like radishes, carrots and herbs. The garden serves as a teaching tool for other women to learn how to grow and prepare similar foods. She and her husband now grow amaranth for food. The plant produces a seed with high nutritional value. Once common in Central America, it was prohibited by the Spanish during the colonial period because of its ritualistic use by indigenous groups. Corn, the mainstay of the Central American diet, replaced it. The couple's income, however, continues to come from the potato production Comitancillo is known for. Most farmers like Patrocinio sell their potatoes locally to middlemen who pay rock-bottom prices. CRS is helping them organize so they can connect to more lucrative markets. This year, some 50 farmers from Comitancillo , including Patrocinio, will sell some 120,000 pounds of potatoes to a national chip company at a price that is 25% higher than the market rate. They receive a higher price because they wash and brush the potatoes before delivering them, instead of selling them straight from the farm. The price takes into account the cost of production, which includes storage and transport—calculations the farmers in Comitancillo have only recently learned to do. Jacinta, who grows potatoes on about 3 acres, wants to start selling most of her crop to the chip company too. CRS is helping her improve the quality of her potatoes so they will meet the company's standards. Connecting farmers to buyers is just one piece of a wider effort to help farmers improve their crop production and be more efficient. "We want farmers to have better control over their farms," says Miguel Angel Orozco Escalante, a CRS microenterprise specialist. "Ultimately, these are going to be long-term changes."